The 2nd race of the 2011 season proved to be a challenging one for the #11 FedEx Toyota Team. Denny would start out strong in 12th place, a high qualifying spot for Denny as he typically qualifies in the back. Denny would go on to fight loose conditions that just couldn’t be cured to finish 11th overall. Early in the race Denny complained of tightness in the center and loose late exit. Unfortunately this would be a song that Denny would have to sing all day. Denny led a few laps after some good pit strategy by crew chief Mike Ford, but would later fall back. Mike Ford made numerous adjustments with wedge and track bar to try and help Denny get to the front but nothing seemed to help. Denny showed much frustration on the radio after some poor pit strategy. With 40 to go Denny came on the radio and asked “when are we going to pit?”. 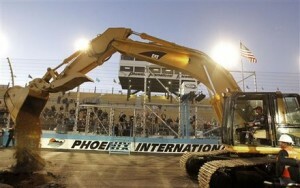 Mike Ford replied “in 20 laps if we don’t short pit”. Denny said “well how many laps are left” and never received an answer from Mike Ford. Mike Ford replied next corner to pit in 3 laps. This is the very situation that bit Denny in the chase, and had Denny not asked crew chief Mike Ford about the situation it could have surely bit them again. Denny would have been forced to pit with 10-20 to go the same situation as the chase last year. 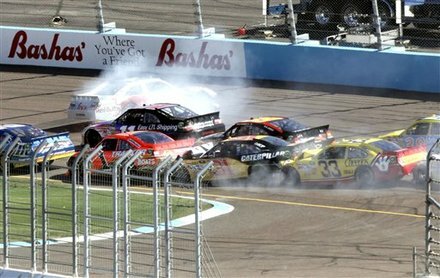 Adding to Denny’s frustration was the fact that the Right Front tire was loose at the end and as Denny stated “falling off”. Denny told them team “we need to get our stuff together”. Overall though an 11th place finish isn’t bad for the 11 team. They typically are slow to start off early in the season. Although the team won’t return to the same Phoenix race track they left, what they learned today will still reflect onto short tracks coming up. Phoenix will be repaved in March, with an all new configuration featuring progressive banking, more of a turn on the backstretch, and a wider front stretch making the track more like a smaller version of Pocono.